FeedWatch is the most effective way to optimize on-farm TMR feeding accurately and consistently. From the developers of DairyComp, FeedWatch is a software designed from a philosophy of providing flexibility while maintaining complete analytical ability. 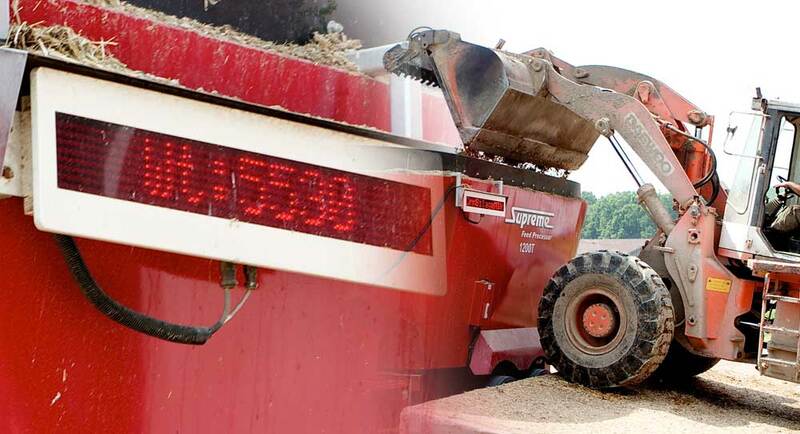 FeedWatch monitors feed usage, sales, purchasing, animal intakes and cost using an industrialized mixer scale indicator made by Avery Weigh-Tronix, and an ultra-bright LED external display. It works with mixer trucks and wagons, or with stationary mixers and delivery trucks. The ultra-bright display makes it easier to see at all times of the day and in all weather conditions. Other features include the ability to export files for consultants, create graphs and customizable reports, set user security levels, manage chemistry levels, and track current and forecasting inventories. FeedWatch dynamically schedules all of your loads. Don't waste your time figuring what each load should be - let the power of FeedWatch do it for you. Once the basics for feeding your herd have been inputted, it will automatically create and schedule loads to maximize the capacity of your mixer. * Feedwatch will automatically size loads according to the mixer's capacity. If your main mixer goes down, any size mixer can take its place without any hassles. FeedWatch directly connects with the DairyComp database to automatically update and integrate all your important data regarding current number of animals per group, and milking information from your parlour program. FeedWatch gives a complete dairy report for easy analysis of production vs. cost of your milking herd. Ingredient mix timers allow for full control over the mixture of the ration. Some ingredients need longer mixing times - simply increase the delay time before the next ingredient! The user-friendly report and graph writer makes it easy to access and generate any report needed. From inventory reports for your lender, to usage reports by pen types, all can be generated with just a couple clicks. Schedule any custom report to run automatically and by your choice of duration (hours, days, weeks, months). FeedWatch uses state-of-the-art weather-resistant equipment that will hold up to the rugged abuse of day-to-day operations. Feed management technology improves the bottom line. How you feed, matters too. Do you know how much your cows eat?